at White Sharks, commonly known as the White Sharks, are the largest predatory fish in the ocean and can weigh up to 5000 pounds. The average female species is 450 and 500 cm in length while the male white sharks species averages 350 to 360 cm in length. White Sharks belong to Class Chondrichthyes, as they have a cartilaginous skeleton with bone deposits only in their teeth and some parts of the spine. They are very impressive creatures, large, fast and dangerous. The circulatory system of this species has heat-exchanging system which helps in maintaining its body temperatures up to 140 C more than that of the surrounding seawater. This permits a higher level of metabolic activities in their body. The ecology and behavior of the Great white Shark is little known and, despite a wide distribution, they rarely encountered. The endangered White Shark’s body is covered from head to tail with placoid scales or dermal denticles that resemble a collection of minuscule scales or ‘teeth’. By virtue of their strength and design, these scales afford the shark two important advantages. First, they act as armor, protecting the fish from major injuries; and secondly, they minimize the friction the shark encounters when swimming in sea water. White sharks are opportunistic and eat marine mammals (including whales), fish (including other sharks), birds and invertebrates. 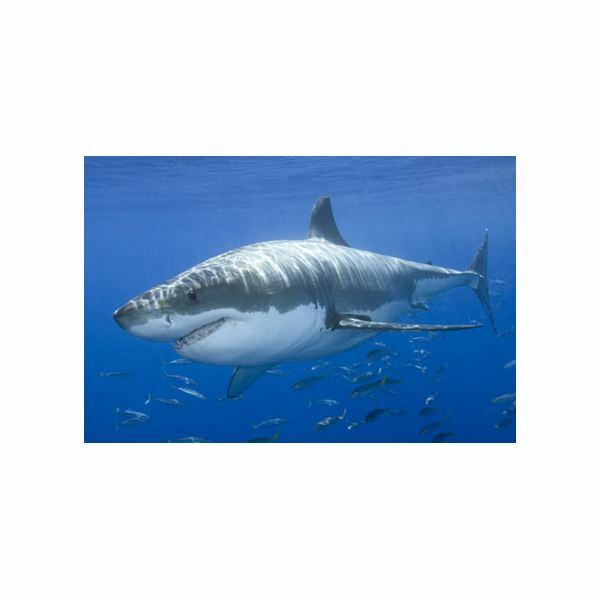 Dolphins, seals (including sea lions and fur seals), sea turtles and penguins are other white shark favorites. They have earned the reputation of being a fierce predator that will attack people, though the attacks on humans are extremely rare. Most of the times, the attacks by other sharks also is mistakenly attributed to the great white sharks. White sharks are predominantly seen in northeastern United States, southern California, southern and eastern Australia, New Zealand, Japan, Malta, Eastern Cape Province of South Africa and the South-Central Mediterranean Sea. Great white sharks are also widely distributed across southern African oceans with the highest concentrations occurring in temperature sea waters, particularly in the vicinity of Cape fur seal colonies. In certain countries, the white shark is fully protected under government laws to save them from becoming an endangered species. Certain countries impose hefty fines, often as much as $20,000 and/or imprisonment for their killing. No research has been able to provide the most accurate population of the white sharks, but educated research reveals enough to declare the white sharks as endangered species. There are several threats to the existence of white sharks. The recreational and commercial fishing, hunting for thrill and self prestige, increasing sea transportation, pollution in sea water, and even building sea resorts at sea shores where white sharks live are a few of the potential threats. Trading in white shark products is also an important reason for the threat imposed on this species. Parts like shark fins, teeth, jaws and meat are salted and frozen to be traded as food items. The cartilage of shark and its liver oil has high medicinal value, which again becomes the cause of illegal trade of its body parts. This has substantially increased over time. Until recently great endangered white sharks were not protected by laws anywhere in the world. Hunters were allowed to kill as many as white sharks as they wanted and could. Each year people killed 100 million sharks of all species. There are several conservation groups who are trying to protect great white sharks to save them from extinction. Conservation laws that forbid the killing of endangered white sharks may be the only way to keep them from truly becoming extinct. There are many organizations working on national and international levels together, to control the illegal hunting and killing of the white sharks. Some are listed below. More information on any of these conversation groups is available online. The endangered white sharks should be listed on CITES Appendix I, until more is known about this species and how to manage it. Strict penalties must be enforced to discourage illegal white shark fishing and trading. All the courtiers across the globe need to come together on one platform to provide shelter to this giant treasure of the biological community. The loss of white sharks would be a disaster to mankind. Of the many kinds of sharks alive today, it is the great white shark that most often captures our imagination. We need to be aware of the importance of protecting these animals.